Ah so now I finally get to see how the car looks today. I have known about the car for quite some time, but had only a glimpse of it until now. Well unless you consider seeing it when I was a kid back in the early 80's. I will have to see if I have any pictures of it from when I was younger and when my dad was running around the same town in the R4 Daytona. I think I have some of his Daytona and the Green one that was up there in town at the same time. I wish I had ran into you down there at the track the other weekend. Would have liked to have talked in person. dad has often stated his only regret was in assuming the daytonas would all be built one way, or this one would have been a hemi car. As others have said..thanks for posting...awesome story! Obviously history is what it is, but something rings a bell that originally all Daytonas were going to be build just with the Hemi ...no? I know I read this somewhere in magazines back in the mid 80s. You could be talking about how the dodge ads said all Charger 500's would have a Hemi, and that got changed? i was having a conversation with dad today, regarding the actual date the car was purchased. he has long said it was september 19th, but hasn't checked the title yet. an old registration renewal form shows it as being purchased on september 18th. this form matches the plate number seen on the car in the photos i posted, but the renewal was never sent in, due to the engine being blown. the car has not been plated since. i was surprised to notice the incorrect XS29 designation was still on the form at this point in time. perhaps when dad gets the title out, it will show the date the document were corrected to read XX29. making the purchase date more interesting is the date on the warranty card was filled out as being September 29th. i am guessing this is the date someone filled the form out, instead of the purchase date. i'm pretty sure this is dad's handwriting, making the date discrepancy more odd. i agree, danny, it would have been nice to meet and reminisce about the old days. this area has definitely seen more than its share of wing cars over the years. i imagine the presence of a chrysler plant had a lot to do with that. the green daytona you mention was bought new by phil roberts, a local barber. the roberts car came from goeke motors in noblesville. he sold the car to larry bell, who, if my memory is correct, was actually looking for a corvette pace car at the time. i believe larry would have owned it during the time frame you know of. 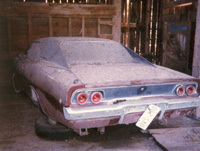 the daytona was bell's first foray into the world of mopar muscle, but definitely not his last. 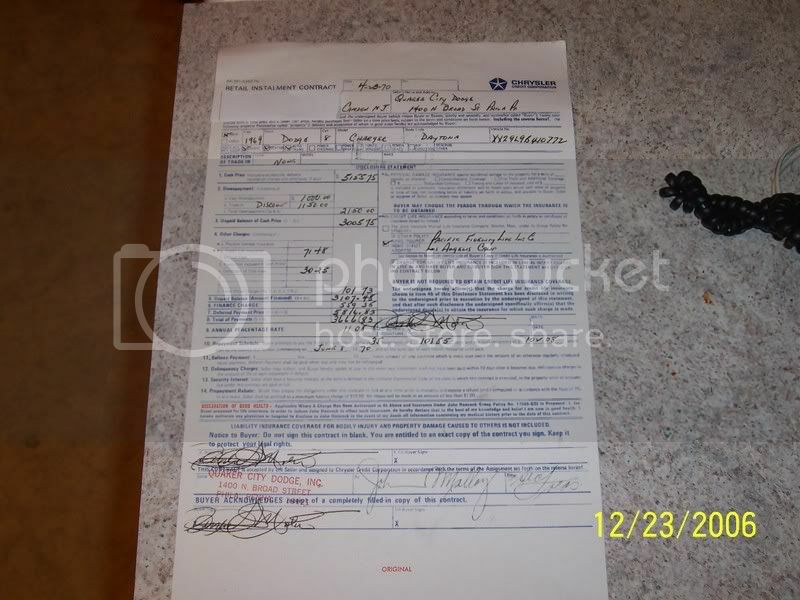 The sales invoice showed final price $5155.75.As I recall it had the dealer temp paperwork when it was driven off Quaker Citys Dodge lot daytona annoucement card etc.The purchasing owner gave me all kinds of papework& copies .The reciept he couldnt find was after few weeks paint flaked off window plug area,He saved the original fanbelts and everything from this 22.000 mile car parked in 1977.
" I have to wonder if showing dad the thread about your car led him to think of how his car could look again"
I have had many comments about my story and our Daytona from that post. But if I have had any positive motivation to get an origainal owner Daytona on the road to restoration that would be one of the best! E-mail me a couple of pictures of the #2 Keselowski Dodge at moparjohn@frontier.com when you get a chance. I will then return e-mail you some B5/B7 Daytona pictures. If you really want to get things rolling bring dad for a visit! You can't be that far away! Great story and thanks for bringing another Daytona out of the wood work to share. It needs a nose cone even if its fiberglass. Rob. hi larry ! nice to finally see you on here. you were dead on, about the clothes line comment. the wing was used to dry my sister's diapers more than once. i had never heard about the apron story, and will have to ask dad if he recalls it. it is pretty cool the vin numbers were so close together, with the cars being in the same town. dad mentioned that phil actually had his car first of the two. we were in tennessee for about two weeks for my grandfather's funeral when farthing received dad's car. i guess we came through rushville late at night on the way home from tennessee, and the car had came in during that time frame. dad recalls someone else was there, begging farthing to sell it to them, when dad stopped in at the dealership the next day. your new 'bird sounds sweet. maybe i'll catch you at the nursing home one of these days, to drool over it and the daytona, along with the other residents there. hopefully you will share some stories and photos of your wing cars, over the years. the guys (and gals) here would enjoy that to no end. take care, and look forward to seeing you sometime soon. see there, she couldn't have done the laundry with the corvette you were looking to buy way back then. if that is your son in the one photo, i am suddenly going to feel REALLY old. i was already struggling with the idea of you selling that car so long ago. lol. dad still laughs when he talks about you buying the daytona instead of a pace car. i can already see him shaking his head, when i tell him you never gave up on the 'vette. from what i saw recently, that vette might not have been your latest trip to the dark side. do the hurst cars even allow that camaro, no matter how flashy, to hang out with them? great car , great story . Thanks for sharing with us your family stories .